For the body of the truck I laminated some pre router shaped inch pieces together. It was difficult to get the wheels round, at first, I used dowel for the wheels but they lost their round shape when I cut them to length, too much end grain type of thing. So ,,,, I took two and drilled a new set with a hole saw and sanded them up which worked a lot better. The axles are 1/4 threaded rod lock nuts and glued little hubs on each end. 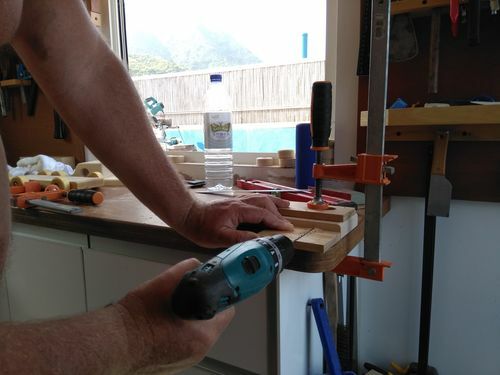 The trucks tray sits on a piece of dowel which makes it removable. Finished off again with Ronseal decking oil to make it nice and durable, hopefully Baby Liam enjoys it and hopefully it lasts for years. Id never done axles before and soon worked out that they would have to be drilled through the chassis acculturatly, And from each side of the chassis so the holes meet in the middle all the time being sure not to run the drill through to the other side. The theory being I needed to start holes either side and let them meet in the middle. I don,t have a drill press so I made up these little jigs to get the drill bit , flat and square. Anthony, your truck turned out really nice, it will surely be a go to toy when he’s ready to haul things around the house. 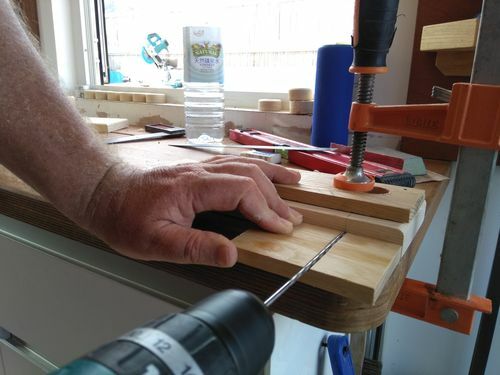 Like your drill press, determination trumps lack of tools every time. AS a toymaker; I can comment! Cute project and Heavy Duty Too!!! If there’s a will there’s a way to get it done, like the jig a lot!!! Thanks for all the comments, Yes I wanted it strong so it will last, running the 1/4 threaded rod right through the chassis helped. 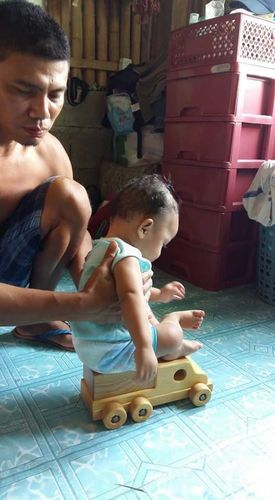 I,m confident the small kids could stand on it and it not break. Very Nice & Well Done Also! Thanks for Posting! What an excellent job you did on this one my friend, and as we all so do I get inspired by other fellow woodworkers… keep it up :) !!! Thank you Steli for the Kind Words and for the inspiration. 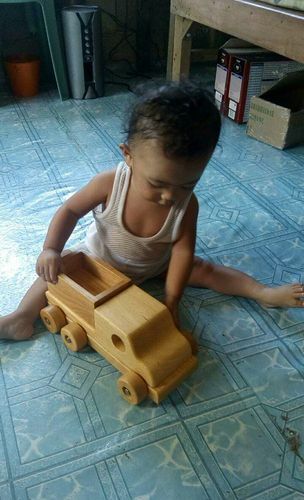 Ok so the toy truck has made its way to its rightful owner in the phillipines, 1 year old nephew Liam. 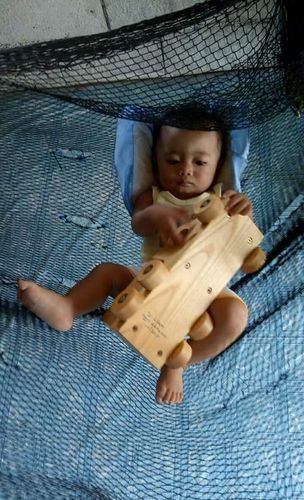 Below is a few pics of him and the truck, reports are that his father Reymond is also enjoying playtime more now. Liam now gets to play with his chicks and his truck. Apparently he even sleeps with it. Thanks Crowe truly appreciate the comment and that someone caught my yesterday’s post.